Although the secret recipe for Coca-Cola is known to fewer people than the U.S. nuclear arsenal’s launch codes, there are other, more expensive fizzy drinks whose exact ingredient ratios are proudly revealed on every label. Helpfully, several websites have aggregated this information into searchable databases, so that you can easily find the total dissolved solids in such premium sparkling waters as Perrier, Badoît, and Vichy. IMAGE: Adding mineral salts to tap water, photo by Martin Lersch, Khymos. 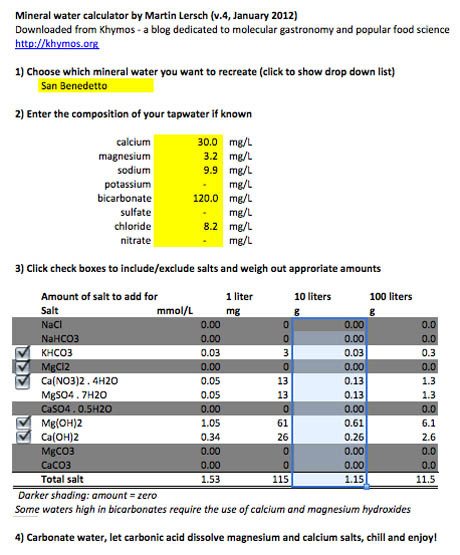 To make things even easier for would-be water pirates, Lersch has created a mineral water calculator — a handy downloadable spreadsheet into which you simply enter your tap water composition (optional, but recommended for best results; your water company should provide this upon request) and select your preferred mineral water, in order to generate a printable ingredients list of minerals and salts. The advanced search allows you to tweak the recipe to exclude hard-to-source ingredients — apparently many are easily found on Amazon or at aquarium supply stores, but food grade sodium bromide (used in cloned Hathorn water) is “next to impossible to find” and aluminium silicate, which is used in glass manufacturing and cloned Badoît, is rather expensive. IMAGE: My recipe for cloned San Benedetto water, generated by Martin Lersch’s mineral water calculator (Excel spreadsheet). 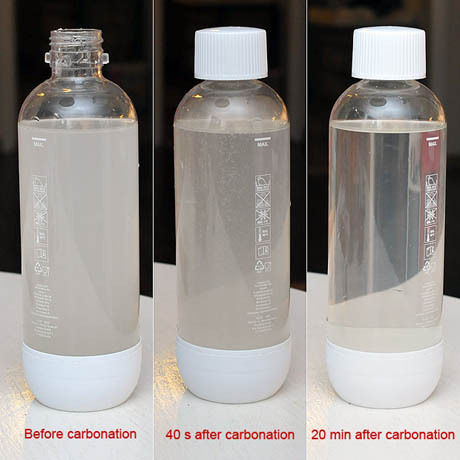 After acquiring your terroir by mail order, you then simply weigh and measure your ingredients, dissolve them in your tap water, and play around with your Sodastream in order to match the level of carbonation (and thus acidity). After just twenty minutes aging in bottle, your guests will be enjoying the citrusy top notes characteristic of Badoit, the pleasant mineral tang of Perrier, or the slight saltiness of Vichy — each the liquid equivalent of Dolly the sheep. High-end hotels may pride themselves on having a water sommelier and suggested pairings, but serving a flight of water clones will undoubtedly guarantee that you win your next dinner party. IMAGE: Martin Lersch recommends letting your freshly cloned mineral water age for twenty minutes in the bottle, to allow the mineral salts to dissolve fully. Photo by Martin Lersch, Khymos. It seems that I was not patient enough. The Generalized directions on this web page call for 20 minutes of so called aging. However, with NYC water and hopefully the correct ratio of minerals for diy S.Pellegrino it took about 24 hrs before all or an acceptable level of the salts were dissolved! I think next time I will try a recipe that calls for less gypsum. I’m not sure but I think that might have been the least soluble constituent. Also, there is a question of wether or not this sparkling water tastes any better or acts differently in any way or is in any way newly similar to said brand name mineral water. If I get to it, I will side by side it with unsuspecting guests as control subjects and blindfolds and what not. It all tastes like Crystal Pepsi to me. I mixed up some san p here in nyc looks like 3/4 of the salts made their way into solution but after 30 min there are definitely still some that have not dissolved. Put 1.692 g into a 3/4 full 2l bottle. Any thoughts? The rest is the same as the tables so these are the one’s I’m having trouble with. And yes, our water is very soft. And this now makes me wonder if i shouldn’t just start with filtered water. Which seems silly if we’ve already got a lot of these minerals in our water. I thought long and hard about a soda stream and did a lot of research. I decided not to purchase one. Instead I got a 5lb tank of CO2 – $86 full, A regulator – $35, A harborFreight Air gun – $3.95 and some FizzGiz caps – $3 each. I like this setup much better. The FizzGiz caps stay on my bottles keeping the CO2 pressurized while in the refrigerator. I drink a few 2 liter bottles of grocery store seltzer a week and my daughter loves fizzy water too! (I thought the two of us were the only ones calling it Fizzy Water). The 5lb tank should last us well into the next decade… or there abouts. I am really looking forwards to trying some of these mineral water recipes! A great post, the thing is does it really taste exactly the same ? 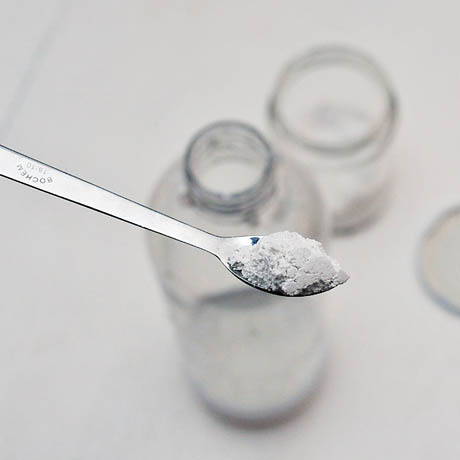 Some salts are toxic, for example, you wouldn’t want to be putting silver bromide (or any silver salts) in your water. That said, sodium bromide, while not exactly non-toxic, won’t hurt you in small quantities. From wikipedia: “NaBr has a very low toxicity with an oral LD50 estimated at 3.5 g/kg for rats.” (data from the MSDS) Conclusion: Search before you salt! This is great! I’ve had a Sodastream for years and now I have a new way to use it. The comment about bromine being toxic would apply equally to chlorine, as in sodium chloride, and is just as inaccurate. Minerals in our water need some sort of counter ion to dissolve, but study some chemistry before making claims about toxicity. Caveat bibitor: bromine (i.e. sodium bromide) is toxic and is not something I would voluntarily add to my water regardless of how good it would make it taste. I had no interest in a soda stream until I saw this. I love sparkling mineral water. But, I rarely buy it because of the unhealthy plastic bottles, nor do I want to lug home the glass ones. Thanks! oh this is hilarious. Next person to go through Italy, stop in a Castellammare di Stabia (around the bay from Naples) and get a sample of the Madonna spring there. Best water I’ve ever tasted, hands down. If I could replicate that, I’d be more hydrated than an manatee. I must say, I love my Sodastream. Having fizzy water on demand with no disposable plastic bottles involved is lovely. I don’t know my favorite mineral water. But this article has given me another reason to consider purchasing a Sodastream machine. The first: reduce plastic consumption. So what did you make? Darcy O’Neil’s history of the soda fountain, Fix The Pumps, has a dozen or so recipes for various spring waters as well as helpful tips on in what order to add your mineral salts for best solubility.